While we haven’t seen too much in the way of must-have Android Wear 2.0 wearables from traditional tech companies like LG or Google, fashion watch makers are fully embracing Google’s new mobile OS. 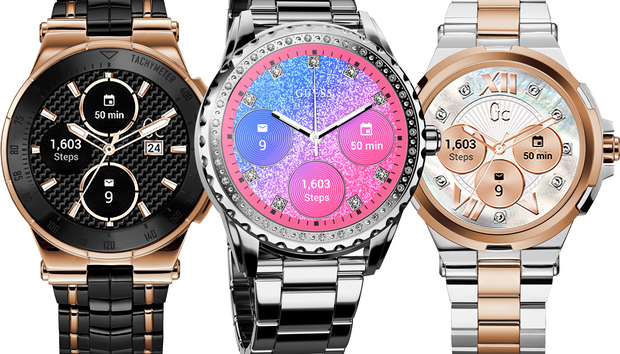 In the past week, Tag Heuer and Montblanc have both announced Android Wear 2.0-powered smartwatches, and now Guess is looking to get some skin in the game too. The company announced at Baselworld that it will be releasing a range of smartwatches powered by Qualcomm’s Snapdragon 2100 chip, both under its own Guess moniker and the higher-end Gc brand. The new watches represent something of a reboot for the original Connect, which was released in late 2015 as a hybrid powered by Martian. Both offerings will come in two sizes tailored at larger and smaller wrists, in a range of materials. The Gc Connect is based on the Structura style, with 318L stainless steel cases in brushed and polished steel, and rose gold or bronze finishes. They will be available in a variety of styles and come with interchangeable bands, with the men’s version offering a ceramic bezel and a PVD or polished steel case, and ceramic, silicon, or leather straps. The ladies’ model features a rose gold top ring in silver, polished steel, or rose gold cases. Decidedly aimed at the fashion market, neither the Gc nor Guess watches will feature LTE. Android Pay was not mentioned in Guess’s press release, and Android Wear 2.0’s fitness capabilities were only given a passing mention, so presumably they will skip NFC, GPS, and heart-rate sensors well. Pricing and availability hasn’t been announced, but Guess is targeting a fall/winter release. Watch this space: We’re still waiting for the first tech-savvy Android Wear 2.0 watch that we need to have, but it’s interesting to see so much activity from Swiss-branded watches. It was assumed that Apple had the luxury watch market locked up with its Apple Watch Edition, but with a mix of modern and traditional stylings, perhaps Android Wear could carve out its own niche among horologists.